A dispute between two brothers over the ownership of a successful chain of women�s clothes stores ends up with a pair of scissors sticking out of the back of one and the other charged with his murder. Fashion Sequence Courtesy of � irene. Inc.
Nancy Kovack (pictured) makes the first of two appearances on Perry here playing Carla Rinaldi. For the past 40 years Ms. Kovack has been married to former Los Angeles Philharmonic conductor Zubin Mehta. A few years ago she re-surfaced in the news when she admitted to being bilked out of over $100K by the infamous Susan McDougal. Also, she played Annie Oakley in the 1965 Three Stooges film, The Outlaws Is Coming even though she is not listed [She is now!] in the Three Stooges trivia list on this site. Submitted by PaulDrake 33, 15 September 2009. + "NK was a student at U Michigan at 15, a radio DJ at 16, a college graduate at 19 & the holder of 8 beauty titles by 20" (IMDb Bio). Her other Perry role was in Golfer's Gambit '66. Mike Bedard 3.9.15. 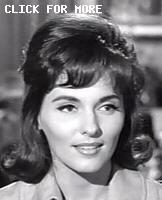 ++ Lucky Vince: Nancy Kovack, who appeared in the later episode TCOT Golfer's Gambit, joined PM veteran Elaine Devry in Diary of a Madman, a dreadful 1963 horror film starring Vincent Price. JohnK, 28 January 2017. Following in the tradition of 1040 N. Las Palmas Avenue, the address shown in the phone book for Joseph L Rinaldi, 1416 N. La Brea, is that of the La Brea Studios where the series was filmed at the time. The studios were originally the Charlie Chaplin Studios, built in 1917. They are now the Jim Henson Studios. Submitted by daveb, 4/11/2010. Carla Rinaldi sips from a cup from the Curious Coffee Set while at a restaurant. Then Della gives Perry a cup of Java from the set. How did it end up there? Added by gracenote, 3/1/2011. Sightings: In the courtroom gallery today, we see Quiet Old Man #1 and Little Old Lady #1. Read more about these favorite frequent faces. Submitted by gracenote, 3/1/2011. +At the beginning of the show, we find the Distinguished Gentleman #1 dining in the restaurant. Submitted by BigBill767, 6/17/2016. Once more, Lt. Tragg (Ray Collins) is billed but does not appear. Added by gracenote, 3/1/2011. Uncredited Actors: It�s another Don Anderson two-fer. At the fashion show, he�s one of the crew busily making preparations, along with a hatted Bess Flowers. You can see him behind Carla Grinaldi (and Flowers appears right before Anderson does). Later, he appears as a courtroom spectator. Added by gracenote, 8/5/2011. Krazy-Kwilt Los Angeles. In the opening shot, watch for the unusual geometry of the intersection (similar to a ʞ tilted 45� clockwise). The view seems to be at the boundary between two of L.A.'s many street-grids. The two grids seen here probably differ in orientation by about 36�. This 1938 map of Greater-L.A. gives an indication of the number of the city's clashing street grids (also this 1926 route map). "It's not a city that spread outward from a center as motorized transportation supplanted walking, but a series of villages that grew together" (from Thom Andersen's 2003 documentary film Los Angeles Plays Itself, script here). Further examine this 1894 bird's-eye map, this photo of Downtown LA 1932 and two more historical prints here. Here's two more air photos of these clashing grids: 1, 2. Errant streets are everywhere! Added by Gary Woloski, 5/31/14. (1) Todd Baylor's medium-color 1963 Ford Fairlane 500 HardTop. The HardTop only came as a 2door; see models here. Todd slides across the front split-bench seat (19:30), so his car is not the similar "Sport Coupe", which had bucket seats and a center consol. I think it's only the vertical lighting that makes it look 2-tone. It was quite deliberate that the intermediate-sized Fairlane looked like a scaled down Galaxie and that the '63 Galaxies and Fairlanes both had the popular "trademark" Thunderbird roofline: compare them in the 1963 Full-Line Ford Dealer Booklet. Added by Gary Woloski, 6/2/14. That well worn staircase set appears yet again as a hotel lobby.